DARREN Weir's plans for Native Soldier's tilt at the Magic Millions Guineas (1400m) next month will rest on a veterinary clearance despite the young sprinter's slashing Christmas Stakes win at Caulfield. Native Soldier ($2.40 favourite) blitzed older and more seasoned gallopers, but was obviously lame on returning to scale. Racing Victoria stewards reported the colt was sore in his nearside foreleg and suffering heat stress after downing Manolo Blahniq and Runson. Weir hopes the chestnut's ailments are minor but he will need to be cleared by vets before continuing this preparation. Native Soldier surged from the 1000m to 600m in 21.5secs before powering home in 33.39secs. His overall time of 1:8.57 compares favourably with Miss Andretti's 1:7.74 course record. 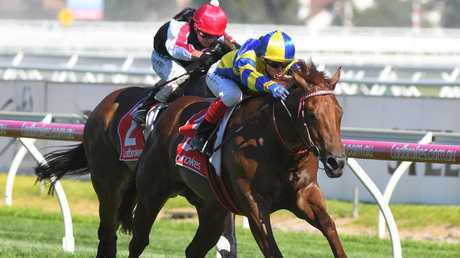 "Hopefully we're on track for the Magic Millions (Guineas) now, we'll head up for the three-year-old race," Weir said. "I told Craig (Williams) to give him a really good gallop today because he needed a 'bring-on' run and he's on target anyway." 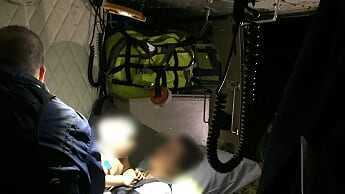 If he recovers, Native Soldier will head north. "He's got plenty of upside. One day I think he'll win a nice race over a mile for sure," Weir said. "I think he's starting to learn a little bit more so hopefully onwards and upwards." 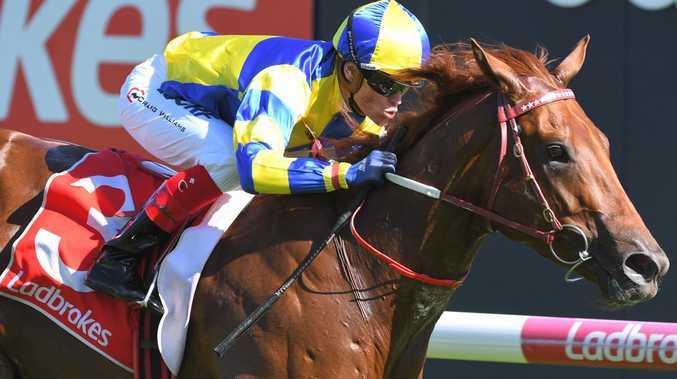 The authority of the win prompted bookmakers to elevate Native Soldier to $3.50 favourite for the Gold Coast Magic Millions after he was $6 pre-race. After 831 days in the wilderness, derision as a racetrack tease, and unwanted status as Australia's most enigmatic non-winner, So Si Bon has had the last laugh. 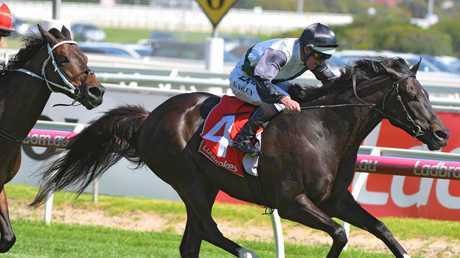 Winless since September 15, 2016, So Si Bon now has a black-type victory in his CV - along with a reputation for savaging his rivals - after ­triumphing in the $120,000 Listed Lord Stakes (1700m) at Caulfield. Co-trainer Ben Hayes summed it up best. "It's a miracle," Hayes said, acknowledging So Si Bon's now improved record of two wins, three seconds and six thirds from31 starts. "Fantastic. Lukey (Nolen) rode him perfect. "Any other horse, I would have been declaring him at the top of the straight, but when he hit the front so early, I did hold my breath. But he did a great job to the line." Placed at Group 1 level and belatedly gelded this year, So Si Bon has become a figure of deep mistrust among punters because of his wayward habits. However, as Hayes pointed out after the gelding defied equal $2.80 favourite Torgersen and Age Of Fire ($7), So Si Bon's lopsidedrecord belied some decent performances. "He's always been around the mark, and he's just been that sort of horse," Hayes said. "Today he paraded well, and it's the best we've had him since he's been gelded coat-wise, and his work has suggested that'sbeen going well. "It's fantastic for him to run to his work, and I'm thrilled. "It's one of the bigger thrills that I've had for a while. He's a teaser. He's teased his whole career. "We've pulled every excuse in the rule book, and they (owners) have let us do what we had to do and we've finally got a result for them." Placed under bans by stewards on three occasions for ­trying to bite rival runners, So Si Bon has featured in stewards' reports in 23 of his 31 starts. But So Si Bon, ridden with aplomb by Nolen just off the speed, was faultless as he boosted his earnings to $399,400. Nolen was impressed, and Hayes left to contemplate an unusual situation. "Now that he's actually won, it might give a bit of confidence, and he could win a few in a row," he said.